This is the story of how I turned my passion for raw foods into a profitable website that allowed me to achieve financial freedom at the age of 26, something most people don't get around to until retirement. I'm writing this article from the front porch of my rented bungalow on the beautiful island of Bali. Off in the distance I can see bucolic rice fields peppering the hills. I've just finished a meal of mangoes - some of the best I've ever had. The sun is shining and the cold New England winter going on in my home state of Connecticut seem very far off. It started in 2008 when I began looking for something that would help me take my interest in the raw food diet - which healed me of colitis and earned my eternal appreciation - and help me spread that message of hope to others. If I could make some extra money at the same time, all the better. Looking around online, I found there actually was a way to create an income-generating website built around what I wanted to write and receive 100 percent of the rewards. Best of all, I'd be my own boss. But How Can You Make A Profitable Website With So Much Competition? There are more than 300 million websites in the world by Google's best estimates, and less than one percent of those are believed to be even mildly profitable. So what made me believe I could actually earn some money from my efforts? 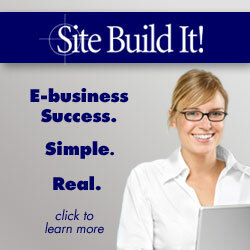 Site Build It is an online tool that drastically simplifies the website-building process, giving you step-by-step advice and clarifying what you're doing so you know you're not wasting your time. I didn't know anything about coding or keywords or much of anything having to do with the web, so I was really pleased that it walked me through the whole process without making me learn a new programing language or anything overly technical. You build your site right from your web browser, and all you have to do is point, click, and type. But the best part is that SBI turns you into an entrepreneur, teaching you how to turn your passion into a profitable business. A 10-day video guide walks you through the process, and as you see your site unfold, you'll grow ever more confident that you're going to make it. So what does SBI provide that the competition doesn't? The key to getting traffic flowing to your new site is to hook in the search engines. Without traffic, the best site in the world won't make any money. But if you know what to do, readers just keeps coming to look at your articles, buy your products, and click on your ads. SBI shows you how to build pages around high-demand keywords - search terms that people type into google or other search engines - so that the engines notice the pages and index them. Your pages are then shown to searchers who are looking for related topics. Find a topic you're passionate about that will also make a profitable website. Find frequently-searched keywords related to your topic that you can build pages around. Use templates that give your site a clean, professional design and logical navigation. Start a link exchange program to get other webmasters to link into your site and increase your popularity. Figure out how to monetize the traffic you're receiving with ads, ebooks, affiliate programs, and other methods. Sign readers up for an ezine and send out a newsletter to them, ensuring that your readers will return and giving you a way to advertise sales and promotions. Add content 2.0 functionality, which really boosts your traffic. Build a community around your site. Have doubts that SBI might work for you? Just ask your question. SBI uses a reproducible model that works for a limitless variety of websites. I've created a successful website based around the topic of raw foods, a pretty niche subject, but there is a teenager who writes about the island of Anguilla, an antique doll collector who turned her passion into a business, a juggler who monetized his hand-eye coordination, and hundreds more. They are stay-at-home moms looking to increase the family income, 9 to 5ers with a desire for more spending money, retail business people wanting to attract customers to their brick-and-mortar stores, and students paying their way through college. I've even met a few retirees who lost much of their income after the stock market went south and needed to replace it. These are everyday, average people who decide to do something positive for themselves and their future. They are not special or privileged or computer superstars; they're normal people like you and me. If you look around Raw-Food-Health.net, you'll see that I've followed the above model. Content: Everyone wants to make money, but no one will bother to come to your website unless you're offering something of value. Once you've found your topic - SBI helps you find a unique niche that you're interested in - you make solid contributions with clear, passionate writing (nothing fancy). You make this information available for free to anyone with an internet connection. There are now tons of free articles on raw-food-health.net that people really respond to. Traffic: The majority of your traffic will roll in from search engines like Bing and Google, but also from websites, blogs, and users of social networking programs that like your content and link to it. Because SBI has you optimize your content with high-demand keywords, you can attract thousands of readers passively. My website's main page is built around the keyword "Raw Food Health," and if you type that into google you'll see my site come up first because of how I designed it. If you don't do this, your site won't get much free traffic, and all the content in the world won't mean a thing. Right now I'm averaging about 1,000 readers a day pulled in through these means. Presell: Your audience is not made up of chattel, but living, breathing people who deserve your respect. Don't treat them like walking dollar signs and act like a used-car salesman. I write like I try to talk to people in real life, offering valuable information for time spent perusing my website. If you can learn to build online relationships with your readers that are built on respect, with your readers coming more and more to view you as an authority, they'll be more likely to respond when you take the next step. Monetize: This is where you add multiple streams of income to your site. They might consist of paid advertisements, a book you've written, affiliate programs through which you endorse the product of another and earn up to 50 percent of the profit, your homemade jewelry, recipe collections, your music, an audio lecture, or virtually anything else you can imagine. Because you've already earned your reader's respect, they respond to your endorsements. My primary income sources for raw-food-health.net are my ebooks and coaching program, although I earn some money off ads and other odds and ends. By following this model you can create a profitable website in your spare time, but continue to benefit from your work in the long term. Once you've created your content, it's there for as long as you keep it there. Visitors will keep coming in to see it without you doing anything extra, freeing you to concentrate on new horizons. Just how much you'll earn through SBI greatly depends on how much time and effort you're willing to put in. Some SBI owners earn $10,000 a month from their sites, while others are mainly in it as a hobby and make a few hundred. Generally, the more you build up your site and increase its traffic, the more options for making money you'll have. I started Raw-Food-Health.net primarily as a hobby in March of 2008, but I was working a full time job and usually devoted only five to ten hours a week to it. By May of 2010 Raw-Food-Health.net was generating a few hundred dollars of income for me passively every month, and I decided to switch into high gear. I quit my job, which was really a big step. I started working on the site full time, soon moving to Asia to enjoy the warm weather, abundant fruit, tropical scenery, and very low cost of living. 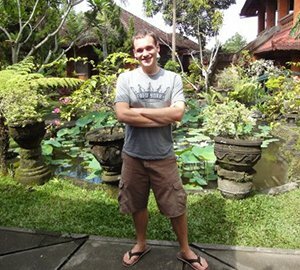 By December of 2010 my site makes me between $400 to $800 a month, enough to cover the very low cost of living in beautiful Bali. I could probably be making more money now, but I refuse to over-monetize my site or endorse products I don't really believe in. For me, self respect and doing the right thing mean more than money. By April of 2012, I'd reached my first month of $2,300 a month income. But here's the crux - the money I make is largely automated, and although it does fluctuate with the seasons and holidays, the money continues to come in regardless of whether or not I continue to work on the site. I keep building my business and my income keeps going up every month. I see now that if I keep at it, I can make a very comfortable life for myself, and its my intention to do just that. I already have an idea for a second site I intend to build through SBI that I'm excited about. I see myself as a entrepreneur launching a business for the long term, and act accordingly. I can work from home- wherever home is - in my pajamas, or in any other way that I want. I never have to answer to a boss, and, frankly, life is good. The obvious class of people who do not need SBI are those who already know how to make a successful web business. These people don't need SBI because they're capable of doing the things SBI does using their extensive skill set and knowledge base. These are things I lacked when I started my site, and without the in-depth, step by step guides and tools SBI provides, I would have stumbled along the way in so many places that I would have given up in frustration. SBI frees you from all this minutia to focus on what's important - creating valuable content that people will embrace. So how simple is SBI? I think it passes, "The mom test." My mom is a good example of someone who is perfectly competent but who never does anything with a computer when she can avoid it. It's safe to say that she knows virtually nothing about computers that she didn't have to learn to function in her job, which isn't too much. I'm quite confident that if she sat down and followed followed SBI's instructions, she could create a successful website. So, in short, SBI is very simple and requires little computer knowledge. Most of the instruction takes place in an action guide that is available in video and text formats. Just watch and learn and then follow the assignments at the end to build you site step by step. Still worried you might not get it? One of the best parts is the SBI forum, a extremely helpful place where veteran SBIers help each other and newcomers with whatever questions they have. I've never met a friendlier group of people, and they played a big role in getting me where I am. There's also a support staff that can help you by email or phone for free. But Why Does It Cost More Than Blogging Platform X? Wordpress, Blogger, Bluehost - there are plenty of free or very cheap blogging and web hosting services out there that won't cost you as much as SBI. There's a good reason they cost so little - they don't give you much. SBI costs $25 a month, which is actually a bargain when you consider what it would cost you to reproduce its tools with outside resources. You'd pay at least $40 a month for the WordTracker keyword research tool, $25 for a good newsletter platform, and an additional $10 a month for hosting and domain registration. This doesn't include content 2.0, many other tools that I've never seen elsewhere, or the detailed step-by-step guides that make SBI such a success. By the way, blogging, as a whole, is rarely a successful or steady way to earn money. But What If I Can't Afford $25 A Month? If you can't afford $25 per month then I seriously doubt your commitment to creating financial freedom for yourself. I made it work on a reporter's meager salary in one of the most expensive state's in the US, and I have a feeling that anyone who is serious could swing it. So cancel your cable TV subscription or get a second job for a few hours on the weekend to make the money. If you're committed, you'll find a way to make it work. Perfect! I think this is actually an advantage because it will allow you to consider many different ideas from various angles, including competition and monetization potential, among others. SBI will help you find a good match for you. You'll probably be surprised at all the things you're competent in when you actually stop to think about it. In retrospect, a raw food website, at least how I wanted to create it, was not nearly as great of an idea from the monetization perspective as some of the ideas I came up with after I'd been using SBI for awhile. I made it work because I'm enthusiastic about it and committed, but I could have made a more profitable choice had I gone in with my mind undecided. Site Build It walks you through how to choose a site on days one through four of the action guide, so I encourage you to NOT decide on a topic before you've been through that process. Site Build It suggests you find at least two hours a week to work on your site, but I'd say five is probably the minimum if you want to see much progress. Think you can manage that? If you can find the motivation and time to build a better future, then bet on yourself and give it a shot. What's the worst that can happen? Because it's such high-quality service, SBI offers a 100 percent 90-day money back guarantee, so you don't have to worry that you're making a mistake. If you find you don't like it or you can't decide on a website topic, then just get a refund. If you can't figure out if you're entrepreneurial material or not, I suggest you ask. SBI has a great program where staff will field your questions. Ask away here. Ready to get started? Head over to the SBI order page. Need more info? SBI's support staff can answer any questions you have. If this page seems a bit selly, that's because it is, and I intended it to be. I created it because so many people asked me how I could afford to hang out in Asia all winter without having a job. The answer is simple: I had help. Not to get too corny about it, but SBI has changed my life by allowing me to quit my job and change direction toward what I want - freedom, passive income, and no more bosses. I launched my business during the worst recession since the great depression, and it seems to be working pretty well. I'm grateful for SBI, and hope others will use it to make their own lives better. If you have questions about Site Build It, ask them in the form below and I'll do my best to answer. I think most people would be happier in charge of their own destinies. Some of you will be curious, but you'll have doubts. Instead of worrying over them, just ask.